HomeWhy do I make spoons? Why do I make spoons? Why do I make spoons? people ask me, but I ask myself as well. Not for money, the way I make & sell them is cumbersome at best. I do sell them, and it brings in some money, but the time I spend at it negates some of the “profit.” I am always appreciative when someone buys one of my spoons, it means a lot to be to have that sort of support. I am not interested in pursuing production runs, efficient sales, etc – that’s not my bag. If I were to get serious about that, I should do it with furniture, which is more lucrative. I’m faster at it, and it’d be a better return for my time. But for me, that’s not what woodworking is about. It’s not as if a household needs dozens of spoons. sure we can use a lot of them in cooking, serving & eating – but be serious. we have way more than we need. And the ones from the dollar store could serve us just fine, and we’d be none the wiser. Indeed, the great majority of the population will never know the difference. But there is this craze about wooden spoons and spoon carving in full bloom right now. Why? Why now? Robin Wood has cited, correctly to some degree I think, that the spoon work is attractive because you need no shop, or certainly limited space. Someplace to hew the blanks, then the rest can be done in your lap. Small quantities of wood. And they don’t take months to do like some large case furniture for instance. For me, there’s more to it than that. There’s a connection between people and raw materials that is now rare. Maybe not in my household, or in yours, but I’m sorry to tell you that we are on the fringes of society. The general population doesn’t even think about these things. 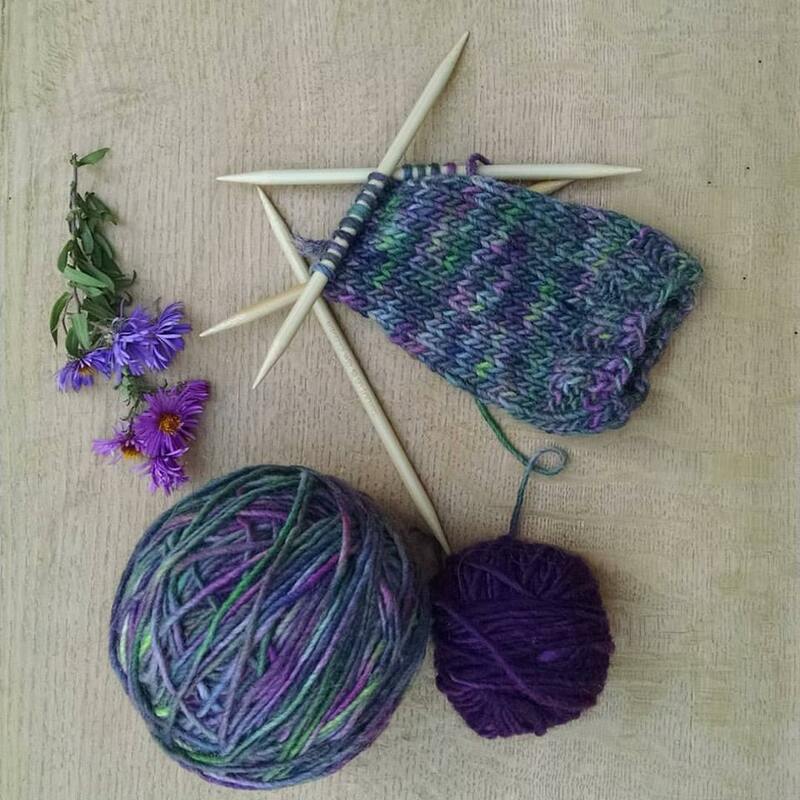 At our house, we like to increase the handmade items we surround ourselves with. Woodenware, ceramics, woolens – as much as we can, we prefer to have people-made stuff around, handmade. There;’s a connection that you think about as you reach for that bowl, that spoon – pull on that sweater. I’m thinking of these things lately for lots of reasons, but one is because I just finished reading A Man Apart: Bill Coperthwaite’s Radical Experiment in Living by Peter Forbes and Helen Whybrow. After I finished the book, I couldn’t concentrate. My mind was swirling around about how to live, what is important, what is dross. The only book I could pick up in the days after finishing it was Thoreau’s journal. I can’t wait to carve my next spoon. In seeing your work on spoons and having a desire to dip a toe into carving, I’ve started to look into spoon work. The main problem is that I cannot seem to find green wood. Living by the Gulf of Mexico, southern yellow pine is all that grows around here (not including scrubs and maybe an occasional oak tree). The nearest apple orchard is about 5 hours away, or any other fruit tree for that matter. Searching for “green wood” has not turned up much. Any advice you’ care to give? I also live on the Gulf coast; depending on your location, there’s quite a few woods that make great spoons. I’ve recently been working with hackberry and it yields itself nicely to carving. Persimmon is also a good fruit wood; don’t forget to check those plum and peach orchards also. I live in the NW part of the state and I’ve never seen or heard of plum or peach orchards around here. I also have not seen Persimmon or hackberry but can’t say I’ve looked either. There are pecan trees a couple hours north in Alabama but that’s about it as far as I can find. I would suggest a good tree identification book. For your location, I recommend “Native Trees of the Southeast” by Kirkman, Brown, and Leopold. No matter where you live in the eastern U.S., you should have ready access to any number of close-pored trees and shrubs that are not too hard to carve. Cherry is ubiquitous. Red maple, river birch, sycamore, hazel alder, magnolia, tulip-poplar, redbud, crape-myrtle, and even sweetgum are great candidates. I’ve even carved wonderful spoons from open-pored woods like sumac and catalpa. I put that book on my Amazon wish list, thanks. We have a few of the trees you mentioned; I’ll keep a look out. I hear you, I live in an apartment so while michigan is overflowing with good spoon wood I have limited access to it. There are websites that sell green wood like http://www.turningblanks.net and you can carve a lot of wood dry without much trouble. After making them for a little over a year it does seem to have become the ‘in’ thing to make right now. It’s true you can get by with a small bunch of tools and space which is good, and hopefully it will get people hooked on the whole handmade wood lifestyle, and they will start venturing into other sides of the wood way of life. Still trying to save up for one of your stunning spoons, and thanks for the blog. 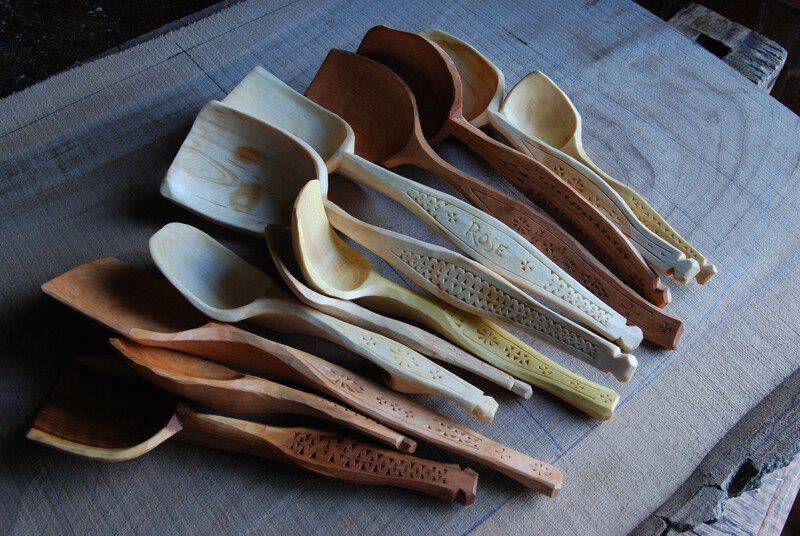 Look up Welsh Love Spoons … Symbolic and decorative wooden spoon carving has been a tradition here for centuries! That was a lovely post, Peter. I am reading it now, and it is causing me turmoil. I remember Wille Sundqvist telling me that he would put on his apron and carve spoon in his lap while traveling on trains. He would trap the shavings and take them with him.I suppose he had spoons roughed out already. You have to admit he had a small shop. Willie is such a teacher. If you had a problem he would leave the knife in your hand, get behind you, put his hands on yours and guide your cuts. And, he always seemed able to help you make the cut that you wanted to make. As Danny Barker said,”It was a real primitive deal.? Thank you Wille. Thanks Peter, I enjoy your posts. There is something special about spoon carving. For me the process is therapeutic. Like you say, we don’t really need another spoon. I’ve given away practically all that I’ve carved and most of them are setting on a shelf. I’ve never sold one, but plan to try that in the near future. Thanks again, looking forward to meeting you when you come to Indiana. Thank’s Peter you have help me out. I have follow you for some time now. My health has left me with a lot of problems. You gave me ideale to keep my mide and hands working. Again thank you !!! Sorry for the spelling sometime things don’t come out right, but getting there. I started carving spoons only 5 or so months ago, but I saw that video of you on the wood Wrights shop about 4 years ago that planted the seed of the idea to carve a spoon, not sure what took so long. Now 70 spoons on I have given the majority away keeping the ordinary ones for myself, im now that spoon guy and from the response I have had people are craving something that has been crafted by hand and they have real joy to posess my spoons and most of the recipients even use them. In any case, thanks for all the inspiration. It is implied in your post, but to make it explicit (and to give credit where it’s also due): If you carved a spoon because you saw Peter Follansbee on the Woodwright’s shop, you may tip your hat toward Bill. Thank you Peter for aiming that snowball in my direction. I’ve given away bunches of spoons too. (And some of those people who received them actually claim to like them!) So it’s gone from Bill to Willie, to Drew, to Peter, to me (and everyone like me: small shop, small budget, surplus of enthusiasm) to everyone whom I’ve given a spoon. That’s a nice big snowball. Cheers! I saw Peter on the Woodwright’s shop as well. I had never carved before and had to give it a try. I have made over 300 spoons and can’t seem to stop. I have given a lot away and sell them as well. I do not make much money but enjoy watching people pick them up, rub them and smell them. I got to visit with a spoon carver here in Missouri and got some very good tips from him. I would love to take spoon carving with Peter someday. I wish people would use the handmade spoons they buy or are gifted…I bought one at the Fuller Museum in Brockton, MA a few years ago…paid $16.00 as I recall, love it and use it daily. The wood only gets warmer. I have enjoyed reading all the comments about spoon carving. I have been carving spoons for several years, and enjoy it very much. The people that have bought my spoons, seam to enjoy them too. I would like to make a stand for using power tools. I use a band saw and a Foredom power carver to carve my spoons. These tools allow me to use any hardwoods I can get a hold of. You wouldn’t believe the beautiful spoons I have carved from Lilac. It is so hard there’s no way to carve with a knife.